BoxNation is set to get 2018 off to a bang this weekend when undefeated IBF welterweight world champion Errol Spence Jr makes the first defence of his title against former two-division world champion Lamont Peterson. ‘The Channel of Champions’ will air the mouth-watering clash exclusively live in the UK and Ireland this Saturday night from the Barclays Center in Brooklyn, New York. In a talent-stacked division 28-year-old Spence is regarded by many as the number one fighter at welterweight and will be looking to prove that unequivocally this year but must first get past a formidable challenger in Peterson. The Washington DC native Peterson is known for his aggressive and come-forward approach in the ring, collecting world titles at 140 and 147 pounds while facing some of the biggest names in the sport, including Danny Garcia, Amir Khan and Timothy Bradley. This Saturday night’s clash, exclusively live on BoxNation, is sure to have fans on the edge of their seats with the exciting Spence coming-off a dominant 11th round win over Kell Brook last summer in which he claimed the IBF welterweight world title. 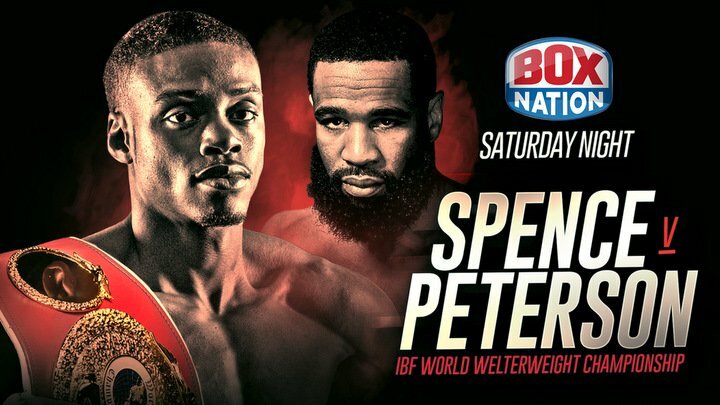 Unbeaten Spence, who has 19 KOs in his 22 wins, is aiming to carry on where he left off but 33-year-old Peterson is also in good form having returned to the ring last year to claim the 35th win of his career over tough Russian David Avanesyan. Peterson too is in an upbeat mood going into the fight and is ready for the challenge ahead. Hall of Fame Boxing Broadcaster Al Bernstein has done one of his Quick Hits videos previewing the January 20th Errol Spence Jr. title defense against Lamont Peterson. The video, which includes Al’s keys to victory for both fighters, can be seen at www.youtube.com/ AlsBoxingHangouts. Al Bernstein returns to the Tuscany Suites and Casino in Las Vegas on Friday, February 16, to again co-host the Kenny Davidsen Celebrity Cabaret Show in the Piazza lounge. Al will perform over a dozen songs in an evening that will pay tribute to the legendary Nat King Cole. Al will have a busy weekend because the following evening he will be ringside at the Mandalay Bay Hotel and Casino in his normal role as analyst on the SHOWTIME telecast of the Danny Garcia-Brandon Rios match. For more information on the entertainment at the Tuscany log on to www.tuscanylv.com.